Vacationing in South Nags Head is different than other portions of the Outer Banks. The beaches here are less crowded, and many people find themselves spending a majority of their time relaxing on the sand for a large majority of their vacation. And if you've had your fair share of "beach time," you're only a few minutes' drive away from some of the finest area attractions, including the Bodie Island Lighthouse, Jockey's Ridge State Park and the unmatched beauty found on the Cape Hatteras National Seashore. Juniper interiors accent this newly-renovated home in South Nags Head. Sandy Bottom offers remarkable ocean views that can be enjoyed on the large wooden sun deck or from several windows in the home. With plenty of room for comfort, the entire family will enjoy everything Sandy Bottom has to offer. The walkway to the beach makes a trek to and from the Atlantic Ocean quick and easy. 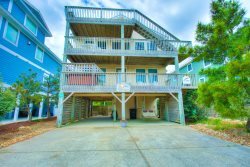 Come stay at the Sandy Bottom for a relaxing and memorable Outer Banks getaway! Bedding: 1 King, 2 Queens, 2 Sets of Bunk Beds. We recently stayed in your home and had a great time. The weather was perfect, fishing was alright, and the house was very clean and meet the needs of our family. It was very nice staying in a home with clean carpet, new shower and the new mattress was wonderful. We loved the oceanfront covered porch. There were only 2 things that kept me from giving it a five, we had to drive about 25 miles round trip out of the way to get the key, key-less entry would be great, and I am spoiled I missed having a clothes dryer, but the clothes line and clothes pens under the house came in very handy. I got on to see if the house was available for Thanksgivings, but unfortunately for us it is booked. Also wanted to Thank You for allowing us to stay for a partial week, four nights was not enough, we hope to go back soon. - Karen Smitherman | East Bend, NC... SEASIDE VACATIONS UPDATE 2015: This home now features key-less entry, and a washer & dryer. Loved staying at Sandy Bottom. Would be great if there was a dryer in the house but would not keep me from renting again. - Jill Sweeney | Glen Allen, VA...SEASIDE VACATIONS UPDATE 2015: This home now features a washer & dryer. Love the location. Great view! All in all love the house. Need to have access to WiFi! Hope to rent house again for same week. - Wanda Martin | Keswick, VA...SEASIDE VACATIONS UPDATE 2015: This home now includes WiFi access.